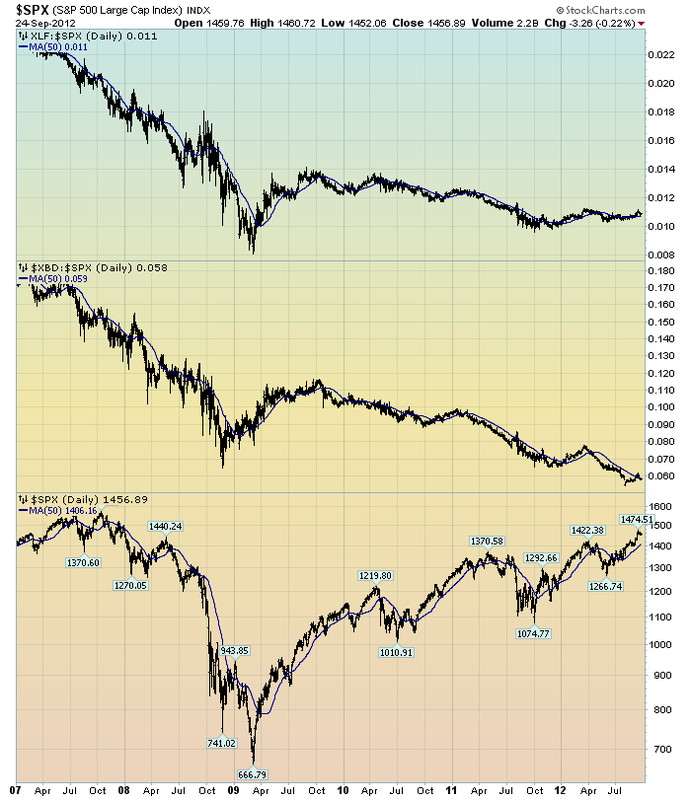 Below are three long-term charts, from Doug Short’s blog post of September 28 titled “ECRI Weekly Leading Index Growth at Highest Level Since June 2011.” These charts are on a weekly basis through the September 28 release, indicating data through September 21, 2012. 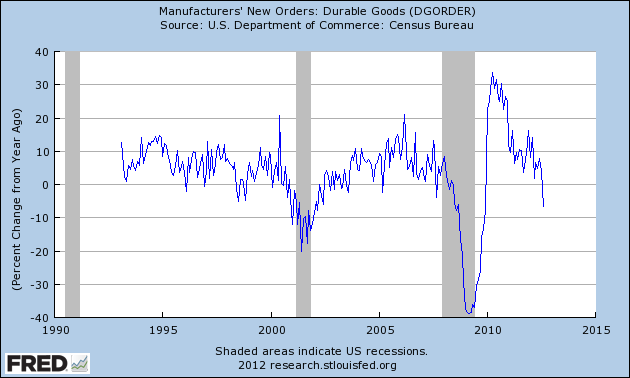 This entry was posted in Economic Forecasts and tagged ECRI on September 28, 2012 by Ted Kavadas. This entry was posted in Economic Forecasts and tagged Economic Forecasts, economic indicators, STLFSI on September 28, 2012 by Ted Kavadas. 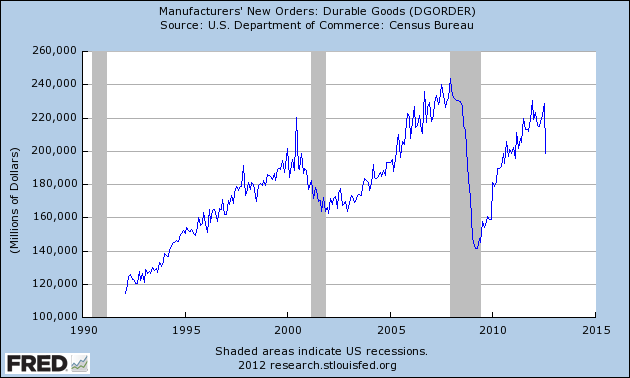 This entry was posted in Uncategorized and tagged economic indicators on September 28, 2012 by Ted Kavadas. Recently Deloitte released their “CFO Signals” “high-level” report for the 3rd Quarter of 2012. CFOs’ expectations for sales and earnings growth both dropped precipitously this quarter, and their expectations for capital investment and hiring followed suit. This quarter’s survey results show that global economic developments have taken a large toll on CFOs’ expectations for their home economies. In the U.S., more than 80% of CFOs believe their economy is either stalling or about to stall, and the proportion is about 65% for both Canada and Mexico. This pessimism is driving the strongest economic concerns we have seen in this survey. Nearly 60% of CFOs mention U.S. or global economic conditions as their most worrisome risk, and one third of those CFOs specifically mention European conditions. But this quarter’s CFO expectations appear to confirm the case for worry – especially in the U.S. Sales growth expectations of 4.8%* are a new survey low –well below the previous low of 5.9%* in the first quarter of this year. U.S. expectations are just 4.3%* (6.7%* last quarter), with Canada and Mexico both at about 6.5%* (they were 5.9% and 8.7% last quarter, respectively). Earnings growth expectations also declined, with this quarter’s 8.0%* a new survey low – well below last quarter’s 10.5%*. The median expectation fell from 8.5%* to just 6.0%* (another survey low). U.S. estimates are lowest at 7.2%* (12.3%* last quarter), with Canada at 8.1%* (4.6%* last quarter) and Mexico at 8.9% (11.7%* last quarter). Capital investment growth expectations, for example, fell precipitously from 11.4% to just 4.7% this quarter – well below the previous low of 8%. Just over half of CFOs expect gains at all, and the median expectation is now just 3% (also survey lows). Hiring also took a major hit, with domestic hiring expectations falling to another survey low at just 0.6%. Just over half of U.S. CFOs believe the economy is still growing, but nearly three quarters of those CFOs believe it is beginning to stall. Moreover, about 45% believe the economy is already stalling, and just under one third of those CFOs believe a contraction is next. Together, this means that more than 80% of U.S. CFOs expect their economy to stall or contract. Pricing trends maintained the top spot this quarter, continuing its threequarter rise to 50%. They are a top-two concern in all sectors except Financial Services. Market contraction concerns rose to 36% (driven mostly by high importance in Manufacturing and Technology), and overcapacity and excess inventoryconcerns held steady at 23% (with high importance in Manufacturing). Market growth challenges held steady at 23% and are a top-two challenge for Financial Services. Revenue from existing markets again tops this quarter’s list with 58% of all CFOs naming it a top challenge – roughly the same percentage as last quarter. 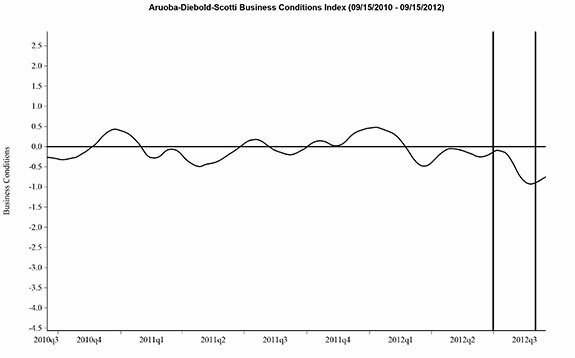 It is again the top company challenge for all industries – a phenomenon that occurred for the first time last quarter. Revenue from new markets held steady at a survey-low 21%, consistent with a possible scaling back of geographic expansion in response to conditions in Europe and Asia. This entry was posted in Business and tagged Business on September 27, 2012 by Ted Kavadas. 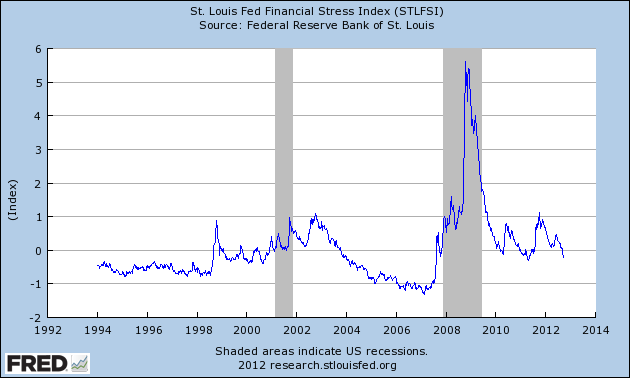 This entry was posted in Uncategorized and tagged Consumer Confidence on September 26, 2012 by Ted Kavadas. 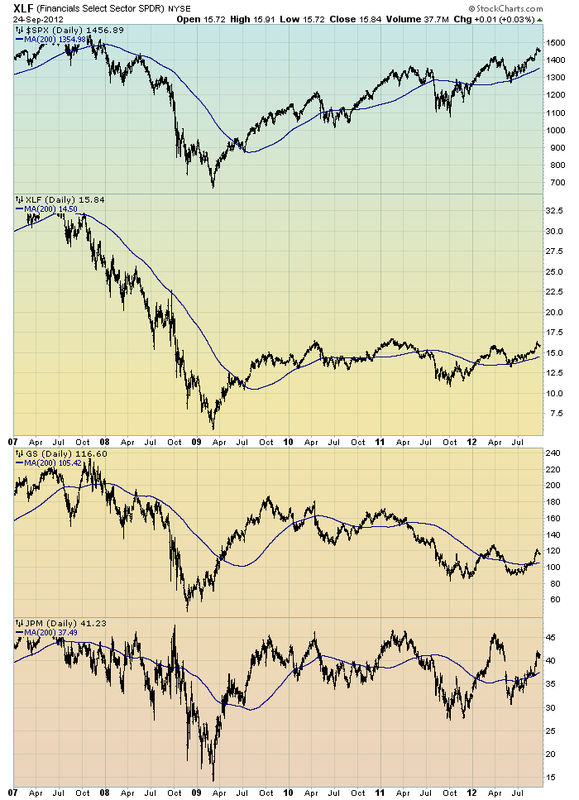 Although financial stocks have increased in price in 2012, I continue to believe that the longer-term “price action” of various financial stocks is disconcerting. I view the poor performance of these financial and brokerage stocks to be one indicator among (very) many that serves as a “red flag” as to the financial markets and economy as a whole. This entry was posted in Investor, Stock Market and tagged S&P500, Stock Market on September 25, 2012 by Ted Kavadas. 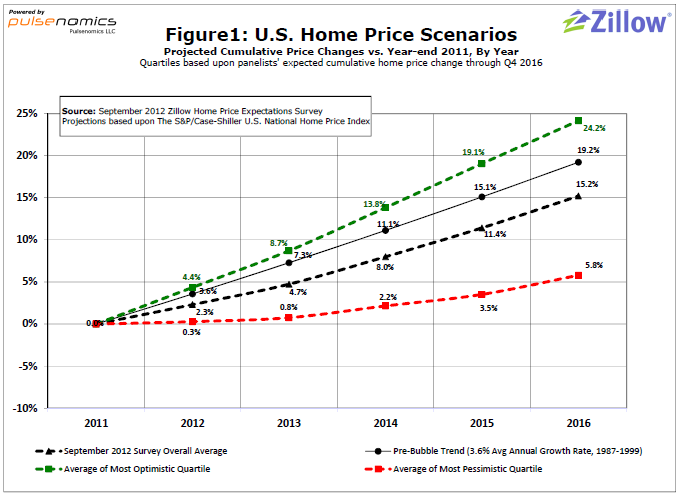 On September 20, the Zillow September 2012 Home Price Expectations Survey (pdf) results were released. This survey is done on a quarterly basis. Other charts are also seen in the brief. 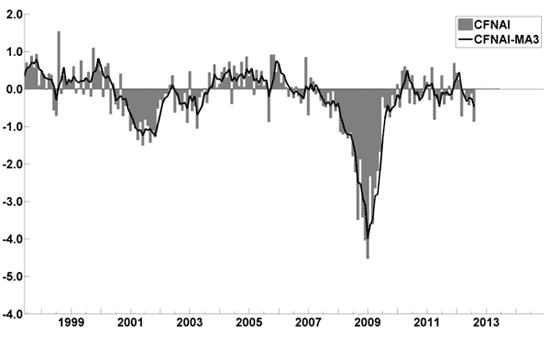 The detail of the September 2012 Home Price Expectations Survey (pdf) is interesting. Of the 113 survey respondents, 5 (of the displayed responses) forecast a cumulative price decrease through 2016; and of those 5, only 1 (Gary Shilling) foresees a double-digit percentage cumulative price drop, at 15.21%. The Median Cumulative Home Price Appreciation for years 2012-2016 is seen as 2.0%, 4.86%, 8.21%, 11.57%, and 15.86%, respectively. For a variety of reasons, I continue to believe that even the most “bearish” of these forecasts (as seen in Gary Shilling’s above-referenced forecast) will prove too optimistic in hindsight. Although a 15.21% cumulative decline is substantial, from a longer-term historical perspective such a decline is rather tame in light of the wild excesses that occurred over the “bubble” years. This entry was posted in Real Estate and tagged Real Estate, real estate bubble, residential real estate, Zillow Home Price Expectations Survey on September 23, 2012 by Ted Kavadas. 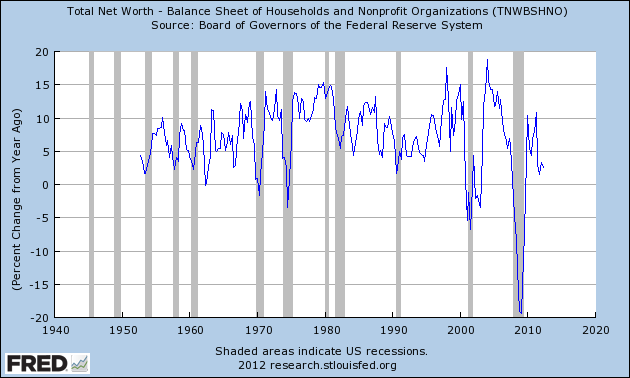 In the September 20 post (“Total Household Net Worth As A Percent Of GDP 2Q 2012“) I displayed a long-term chart depicting Total Household Net Worth as a percentage of GDP. 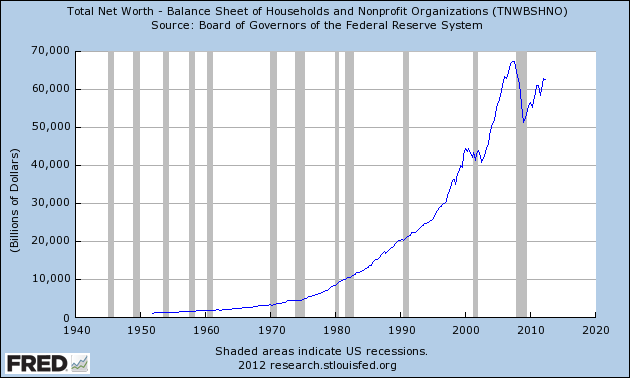 This entry was posted in Uncategorized and tagged household net worth on September 22, 2012 by Ted Kavadas.